» Happy One Year Anniversary! There is a place that exists between seconds, between thoughts and between worlds. A Rift in time, where forgotten ideas and unfinished dreams collect like pooled rainwater - where unfinished spells and undone nightmares gather when pounding hearts break their hold in other realms. Such a place is called the Rift. And for a time, the Rift was in balance. But bit by bit, it lost its grounding. The light lost its traction. The shadows grew teeth. Its inhabitants called out in prayers, asked for salvation from their corrupt Gods. Their cries were heard by foreign deities, who came in force, wrenching lands from the Rift and into the light of Helovia. Together, Helovians and Riftians murdered the corrupt Gods, bringing ruin to the Rift itself. Godless and heartless, the very earth began to bleed out its magic in a slow and painful death. The deities - Kisamoa and Hope - and the inhabitants are doing everything they can to prevent it from dying. They have returned hope to the lands and pushed away the darkness cloaking it, but desperate times require drastic measures. Saving the Rift is up to everyone - and that includes you. Korri's history is somewhat of a mystery, but what we do know is that he has a thirst for vengeance on those that have been wronged. He's made friends with many and very little enemies, but that might change. We can't wait to see his development from here! Congratulations! "The first thing that hit Peregrine was the cold. It slammed into her lungs like an icy fist. The second thing that hit Peregrine was a tree. It slammed into her ribs like a great, big, bloody, pine tree." Hope has set the inhabitants of the Rift down the PATHS: four paths, four Gods. It is a race, of sorts, to see which God's Champions will win. New players fill out an application here. One application per player (not per character). Completed or incomplete applications go here. 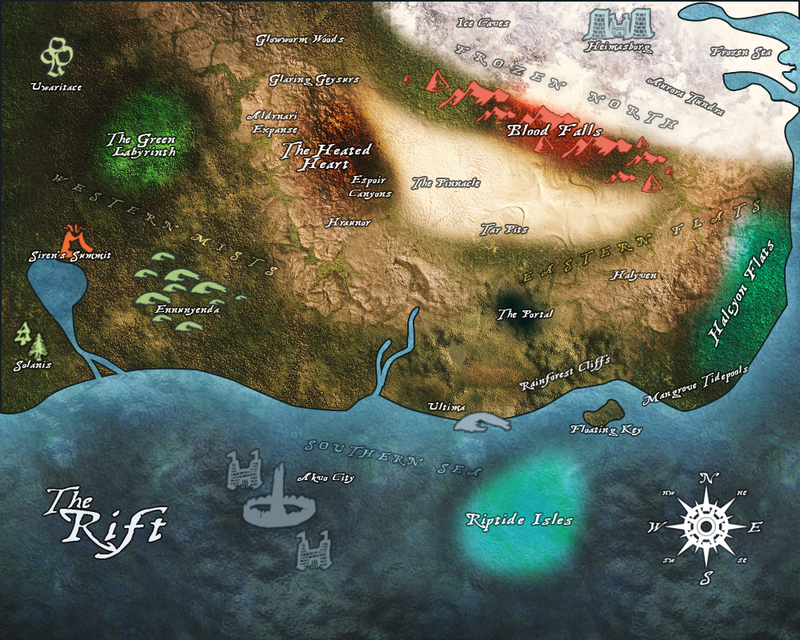 The northern regions of the Rift have pulled a short-spanning, but massively tall mountain range from other worlds. This condensed Blood Mountain range stab out of the earth, providing a home for the region’s heart: the Blood Falls. Also, it marks the beginning of an alpine forest and frozen tundra that gives way to a northern sea of ice. As one passes through the edges of each land, they are shrouded in dim shadows and distorted light. The eastern regions of the Rift, though deceptively flat, are far from lifeless. What may, at first, seem to stretch as a lifeless and monotonous landscape quickly reveals itself as a minefield of dangers and delights. Starting at the eastern coast with its heart as the Halcyon Flats, this absorbed land stretches inland as a desert. Any life that succeeds here must learn to hide in plain sight. As one passes through the edges of each land, they are shrouded in dim shadows and distorted light. Arid, red-tinged mountains roll in gentle waves and jut skyward as modest peaks in a portion of land that seems never quite gripped by the harshness of the elements. Scorches are mild in the greener fringe areas, and the warm center offers many dry nooks and crannies in Drench, and Freeze seems little more than an occasionally biting-cold rainfall. The southern regions of the Rift have pulled a vast, warm sea into its dimension. In doing so, the foreign and hungry ocean wrapped around the existing lands, spreading far to the north and creating the Frozen Sea. The temperate water provides thick and humid air along the coasts, growing beautiful rainforests and aside from a short expanse of cliffs in the southeastern shore, sandy and verdant beaches stretch along the southern coasts. Amid the warm sea’s swells are it’s heart: the Riptide Isles. However, beneath the waves holds the south’s true splendor. Take a bite of the Malspira plant and discover the Sea’s delights… beware diving too deep, for who knows what dangers lurk in these dark depths. The western regions of the Rift are pulled from a realm whose life force must have been a misted, ethereal creature. A film of fog covers the entire west, with various landmarks bulging out of the unearthly vapor. At its magical heart is the Green Labyrinth, waiting to cause unwary wanderers to be hopelessly lost. Low hills roll in the southwest the give way to a freshwater inlet. Strange things hide just beyond sight in these mists, so it’s best to pay close attention to the fluorescent radiances all around. Whenever we're running official contests, this board pops up! It's just like magic! Contribute to guided discussions or share your own ideas for the site! Boards of chatting, arting, and writing for players! Table trackers, plotting, character aspirations, and more! Please post your ads here! Use the LINK BACK prefix if it's a link back, thank you! Password for the Advertising board is 'adelbert'!